I am back from a long weekend in Edinburgh and still buzzing from the experience. For the last few weeks I had been in a state of great excitement, and some angst too. 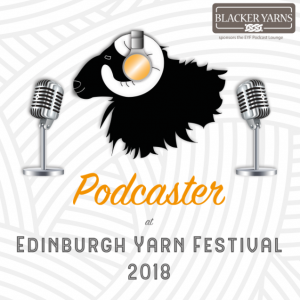 Edinburgh Yarn Festival (EYF) is a key event in the UK for anybody who loves wools with a texture and a back story and who is inspired, nurtured and supported by the online knitting community. It is also a bustling event with lots of crowds and the loud thrum of contented chatter and chance meetings. Whilst I was like a child before Christmas, counting down the number of sleeps, I also became more nervous that noise and crowds would overwhelm my depleted energy and constant pain levels. As well as sleeping a lot in the preceding weeks, I also planned my trip like a military operation. I carried out an audit of my existing yarn. I drew up detailed lists of forthcoming projects with yarn requirements; of exhibitors to visit (organised based on stand number); of possible combinations of purchases to marry up my wish list with my budget (i.e. planning in the alternative); of people to try to meet (complete with their Ravelry/Instagram name)… I also pulled together fabric swatches to ensure any wool I bought would co-ordinate with the rest of my handmade wardrobe. Mr M jokes that I can be a bit Teutonic in my planning but when energy reserves are low, it’s the only way! Come Friday morning, I ventured into the marketplace with a plan. Visit two to three stalls, then break for tea and a chat. Repeat. Armed with my lists I managed to stick to it… mostly. At an event that brings together exquisite local wools I was always going to be a bit heady with yarn fumes, but my planning in the alternative paid off. Where I deviated from my list it was only a variation on a theme. I was still buying for specific projects on my list and working with my limited palette. And the tea and chat…? 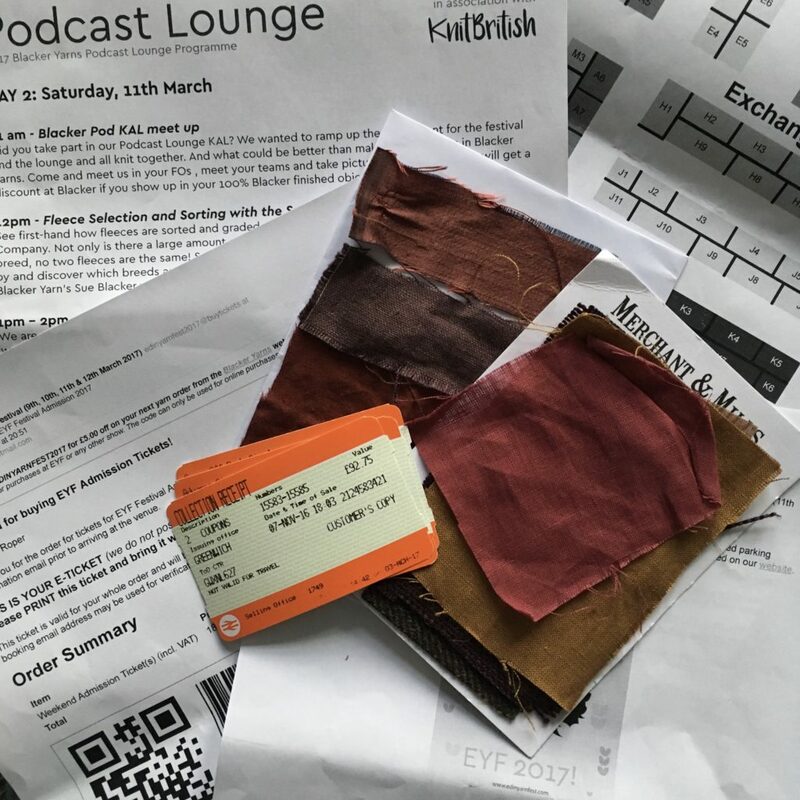 One thing I didn’t think to plan for was how getting from the marketplace to the café queue, toilets, cloakroom, podcast lounge… might involve bumping into two or three familiar faces and stopping for a chat. Thanks to my Teutonic planning, however, I had the energy and headspace reserves for two days of serendipitous meetings with kindred spirits, conversations in four languages with complete strangers – such is the cosmopolitan nature of EYF! – and planned catch-ups as well as lengthy conversations with old friends and new ones. There were lots of hugs, plenty of giggles (like listening to two lovely ladies talk at cross purposes about the Norwegian wood book) and endless amount of wool squishing and knitwear stroking. There were also some down-right surreal moments (one involving a package of spoon knives; another a chance meeting in the middle of the road)! One of the best things about the EYF (aside from the emphasis on small and independent yarn businesses and place-based wool) is that it is not just a space to discover and enjoy yarn but also a place where wool inspired relationships, whether forged online or off, can thrive. This truly is the festival where wool loving introverts can feel safe and supported. And it is precisely because of this focus on community that I keep coming back! Featured image includes wool by Woollenflower, Uist Wool, The Little Grey Sheep and Blacker Yarns. 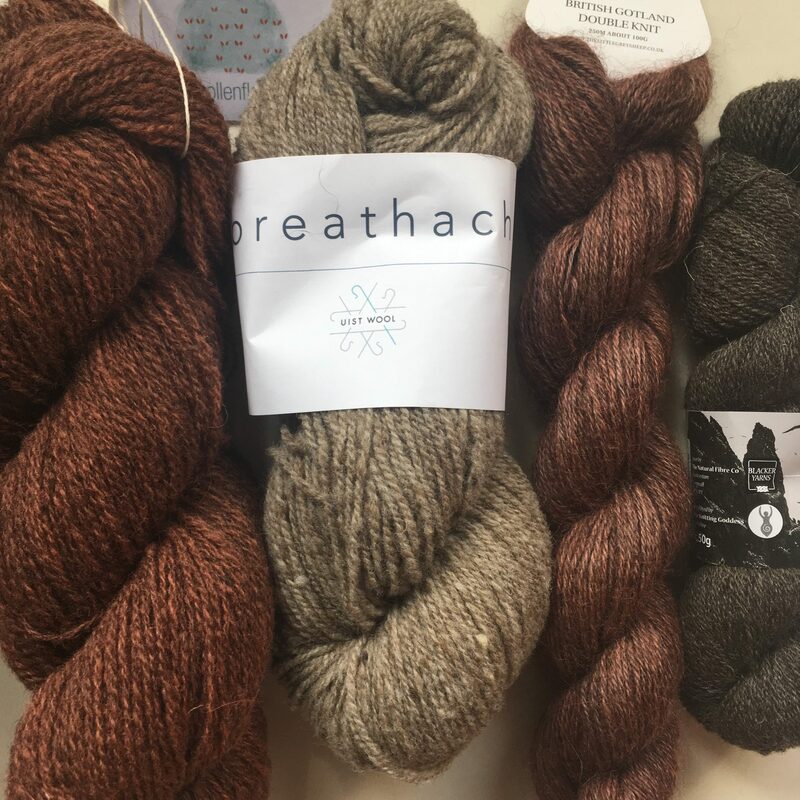 I have only included a glimpse of the yarn I brought back from EYF in this post as I plan to explore and review my new wool in the future in a new-to-me medium: audio podcasts. There I’ve said it so it will definitely happen now! One of the items on my EYF to-do list was to pick people’s brains about the technical aspects of podcasting and I came away with lots of suggestions and tips so watch this space! A podcast! How exciting -will definitely listen. I have been so inspired by your learning of all the crafts and your thoughtful approach to the slow and meaningful making of your wardrobe. A wonderful summary of what must have been an inspiring weekend. I can’t wait till next year! I’m looking forward to your reviews of the yarns you bought which all look very interesting! I hope you can make it next year. I’m not generally a fan of busy events but EYF is definitely worth making an exception for. Oooh podcast! Looking forward to hearing about your yarns and EYF. Well done sticking to your plan. I didn’t really have one this year (focus lacking in my life right now) and definitely had a few deer-in-headlights moments. Thanks, Leah. I knew I didn’t have energy for deer-in-headlight moments so I blitzed the marketplace with my list. I am sure I missed out on discovering new stuff as a consequent but I am very happy with the wool I bought as it will work well in my tiny handmade wardrobe. Nice to bump into you while I was trying to choose my Samite colours (that took three attempts in the end). I’ll look forward to your podcast – how exciting! Like wise, really good to bump into you again. The Samite was gorgeous but I resisted for the time being. Which colour did you end up going for? Bursting Figs (dark purple) and Aspen’s Shiver (silver). I thought I would wait, but when I saw it person it was difficult to leave it there. It was joined by a skein of St. Kilda too.